The majority of South Africa’s overseas visitors flock to the vineyards of the Western Cape, the seaside towns of the Garden Route, or the tropical beaches of Durban. However, for those looking to get off the beaten track, there is another option - the spectacular coastal wilderness of the Eastern Cape’s Transkei region. The name Transkei translates roughly as “the area beyond the Kei”. Although its borders were once more rigidly defined, today the Transkei generally refers to the stretch of coastline between the Great Kei River (located just north of East London) and the Umtamvuna River, which marks the border between KwaZulu-Natal and the Eastern Cape. The Transkei area has a long and convoluted history defined by political struggle. It is the ancestral home of the Xhosa people, an agrarian ethnic group established in the area long before the arrival of settlers from Europe in the 17th and 18th centuries. However, first the Dutch and then the British realized the agricultural potential of the fertile Transkei, and from the 1700s onwards conflict over land flared up regularly between the colonial settlers and the cattle-grazing Xhosa tribes. Ultimately, the Transkei region became part of the British Cape Colony in the late 1800s. It was only during apartheid that the Transkei became a formally defined area, however. In 1959, it was established as the first of ten Bantustans or black homelands set up under the Bantu Authorities Act of 1951. These Bantustans were areas set aside for members of specific ethnic groups, and in theory, their purpose was to give tribes like the Xhosa political autonomy. In reality, though, they were simply an extension of the racial segregation policies adopted by the apartheid government. The Transkei was one of two Xhosa homelands, the second of which was the Ciskei. In 1963, the Transkei was the first Bantustan to be granted self-governance, although in practice its autonomy was limited. In 1976, the Transkei gained independence from South Africa (although South Africa was the only country on the international stage to recognize Transkei as its own country). This meant that the Transkei had its own Prime Minister (and later, President) and that its residents had to cross border control to enter South Africa, where they were no longer considered citizens. The Transkei capital was Umtata, now known as Mthatha, and its government was effectively a one-party state. After the fall of apartheid in 1994, the Transkei government took part in negotiations for the new South Africa. On 27th April 1994, the state was integrated back into South Africa and became part of the Eastern Cape province. 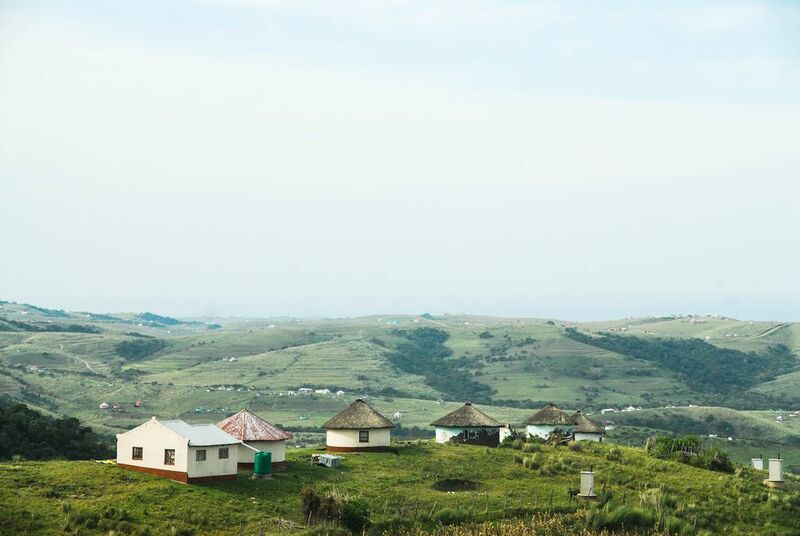 However, while today’s Transkei is undoubtedly part of South Africa, the region has retained its own identity and culture and has a unique atmosphere that can't be found anywhere else in the country. It remains a stronghold for the Xhosa people and has a proud political heritage with many civil rights leaders claiming Transkeian roots - including Chris Hani, Walter Sisulu, Oliver Tambo, ​and former president Nelson Mandela. Despite the political upheaval of the last three centuries, the Transkei is still largely rural. Subsistence farmers eke out a living from tiny backyard plots, and livestock roams freely across the region’s gently rolling hills. It is a place defined by its unique sights - from the herds of spotted Nguni cattle that frequent the Transkei’s abandoned beaches to the round Xhosa huts or rondavels painted in shades of vivid green and pastel pink. For the intrepid vacationer, the Transkei offers the chance to escape South Africa’s bustling cities and experience the pristine beauty of the Eastern Cape firsthand. The Transkei is home to some of South Africa’s most spectacular scenery, including dramatic cliffs, serene rivers and uninterrupted stretches of golden sand. Consequently, it is the perfect destination for those with a passion for outdoor pursuits - including fishing, surfing, hiking, and game-viewing. Infrastructure is basic here and part of the charm is in leaving civilization behind. However, there are backpacker lodges, rustic beach resorts and elegant old hotels strung along the coast at various strategic points. Each of these places is defined by a relaxed vibe that transports visitors back to a less complicated era. In a place full of hidden treasures, there are a few destinations that really stand out. For surfers, rural Ntlonyane offers a legendary right-hand point break, while beautiful Kei Mouth boasts spectacular plunging cliffs and beachfront horse-riding trails. Coffee Bay is a paradise for backpackers and hikers alike, and Port St Johns is conveniently located near several game-filled nature reserves. For photographers, it’s hard to beat Hole in the Wall, where a free-standing sandstone arch acts as the Transkei’s most iconic landmark. For fishermen, spots like Wavecrest and Xora offer the opportunity to fish for kob and grunter both on the rocks and in the river. NB: The best (and sometimes the only) way to explore the Transkei is to rent a car and do so independently.